About 20 years ago, when some may still have called him young or at least youthful, I realized the hubs was a geezer. It’s a long story involving a perfectly nice young woman with a nose piercing. Even with that snippet, you can paint the picture. This realization has been reinforced many times since, often involving the dogs. For example, feeding spoonfuls of his DQ Blizzard to the dog then feeding himself with the same spoon. I hope no one is eating as they read this, apologies. . . 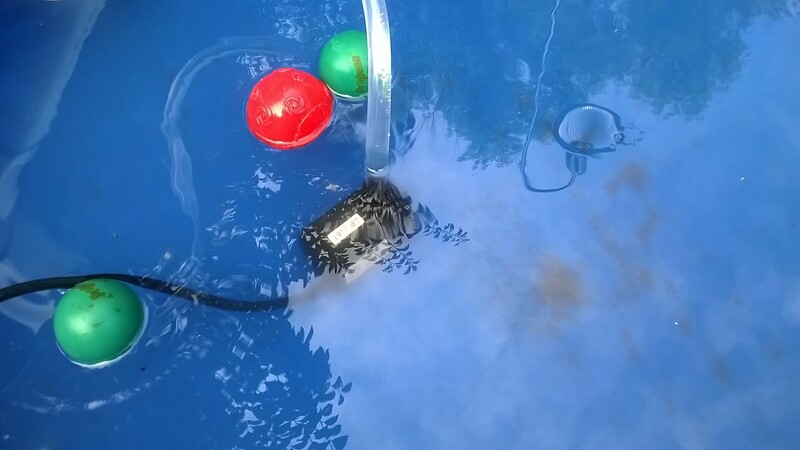 The latest evidence involves Iko and her pool. Let me begin by noting this is Iko’s second pool. The pup’s only a year and a half old. She’s the only pet to get a pool, no less two. Give me a G! 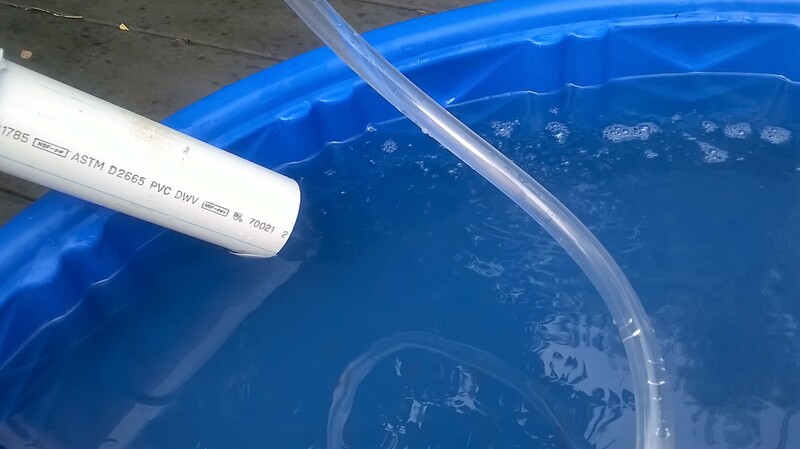 That mess of PVC and tubing is a filtration system. The pool and accompanying kludge displaced a lovely fountain that used to grace the deck. Give me an E and another E! This is the pump that runs the system. The fountain pump wasn’t sufficient. 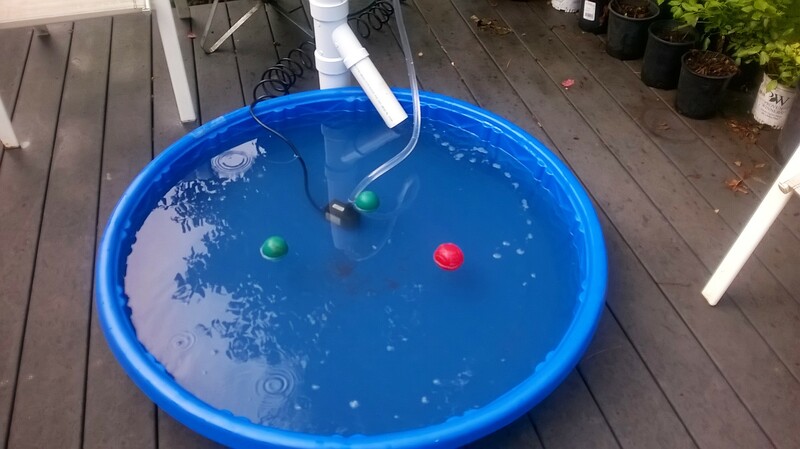 He spent actual money to get a bigger pump. Give me a Z! The clamp (actually a plastic clothespin from Target – only the best – usually employed to hold shade fabric in place over spring garden plants) holds the tubing in place because, well, it might fall out. That is an actual concern? Give me an E! 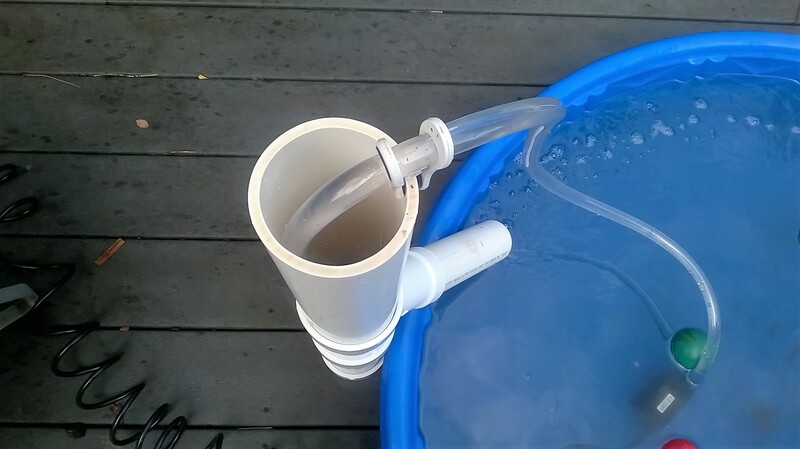 The 2-inch PVC spout was salvaged from the previous attempt at a filtration system. The use of this pipe was extolled to me as a money saver. Give me an R! 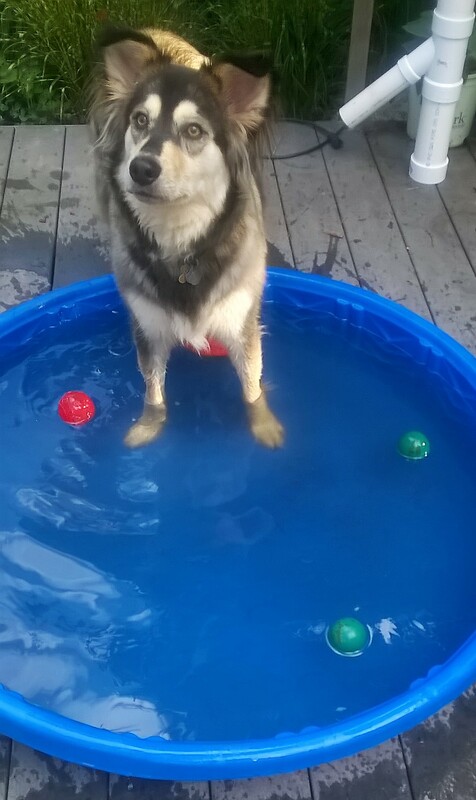 In the recent heat wave, Iko enjoyed her pool at least twice a day. That means the hubs was out of the house for extended periods twice a day while I was inside enjoying the blissful sound of silence. Give me a half dozen exclamation points!!!!!! Again! Again! The little girl says as she spins the revolving door in the TV commercial. The joy of repetition of a joyful thing. Mostly. Twice last week I made desserts with a long, dependable history. Both reminded me of the tension-filled joy of cooking. It’s all in the details. The hubs went off-list at the grocery store. I remembered that you said you wanted bananas, so I bought bananas! He said. Two rules of buying bananas: No more than four, and on the green side. I eat only half at a time (the end of the other half protected with a food hugger), and less-than-ripe bananas have some nutrition stuff that’s really good for you. I remembered the smart thing to do, not the specifics. . . .
Six almost fully ripe bananas were a problem waiting to happen. 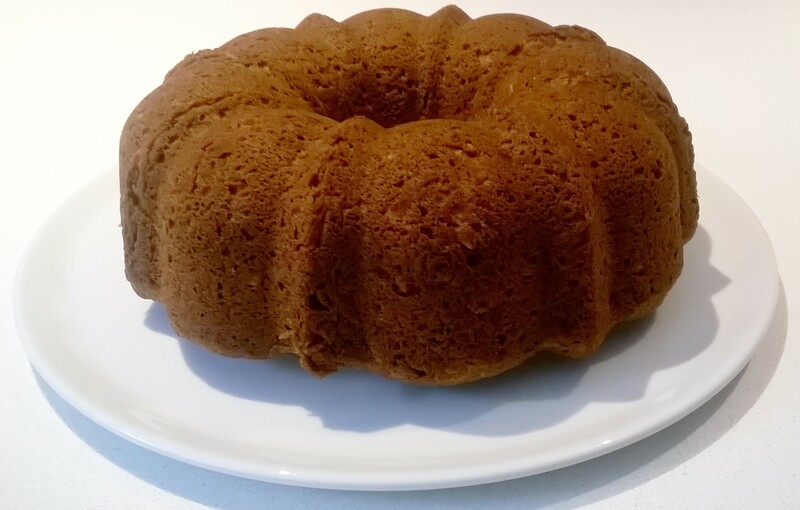 I dug up an old favorite recipe for banana cake which is actually a blend of two recipes. Here’s what I saw. I haven’t made this in a long time. First, I accidentally followed the cake recipe, thereby putting in too much flour. 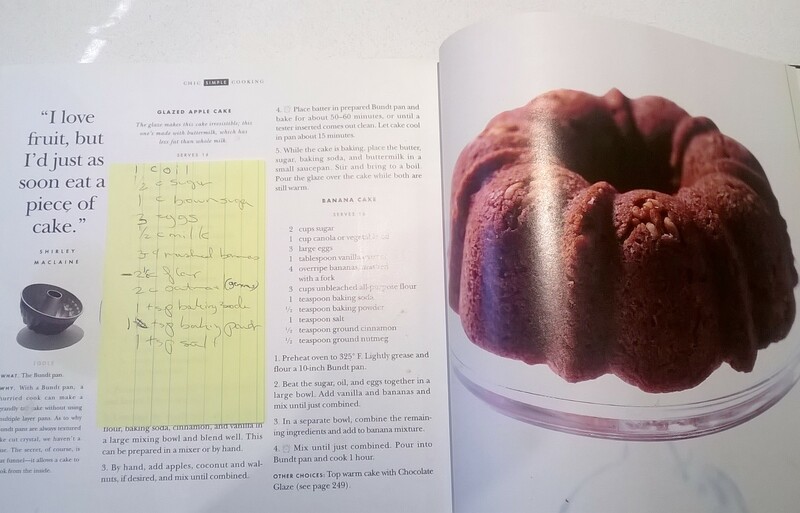 Then I proceeded to just guess — reduced the sugar a bit, went generous on the salt and baking soda, added less oatmeal. It worked! Loved the outcome but doubt I could repeat it. That leads us to the ice cream. As per my stated goal, we are eating only homemade ice cream this summer — aside from a moment of weakness brought on by a sale of Eskimo Pie Ice Cream Sandwiches. 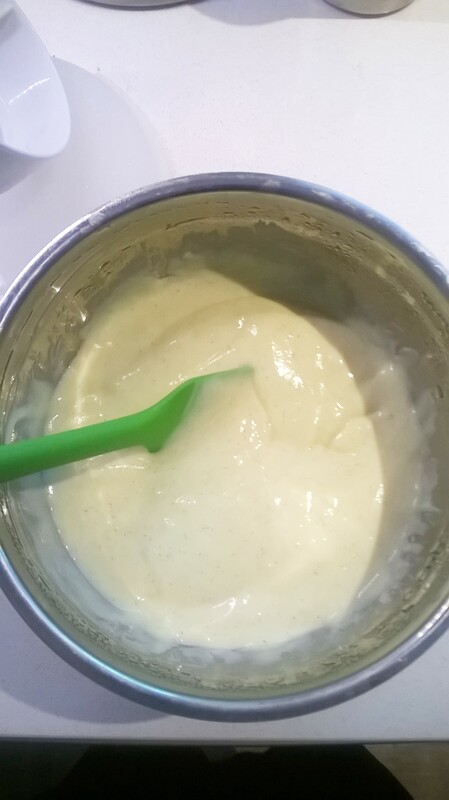 After a good freeze, the ice cream turned out much softer but still nicely set. No need to let it warm for a few minutes before serving. The hubs said it was perfect, preferred this. Do it again, again! I would, but I don’t know what exactly caused this consistency. So I proceeded to revert to the old method to see what happened. Harder simmer on the mix, super-cooled overnight. 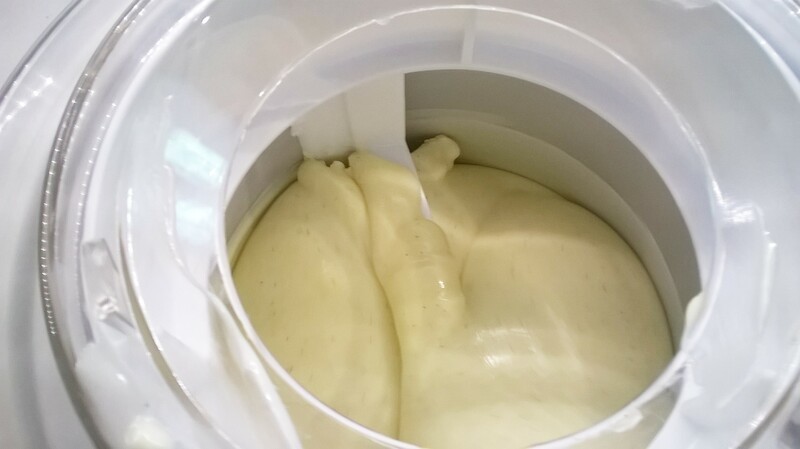 Let it sit at room temp for about 20 minutes before churning. It’s softer than usual, but not the texture of the first batch. I guess that’s the problem with us creative types — we just hate doing anything the same way twice. Went to a soiree last Saturday evening at a friend’s swanky new home. In the email invite exchange, he said the savouries were covered and I could bring a sweet if desired, but not required. 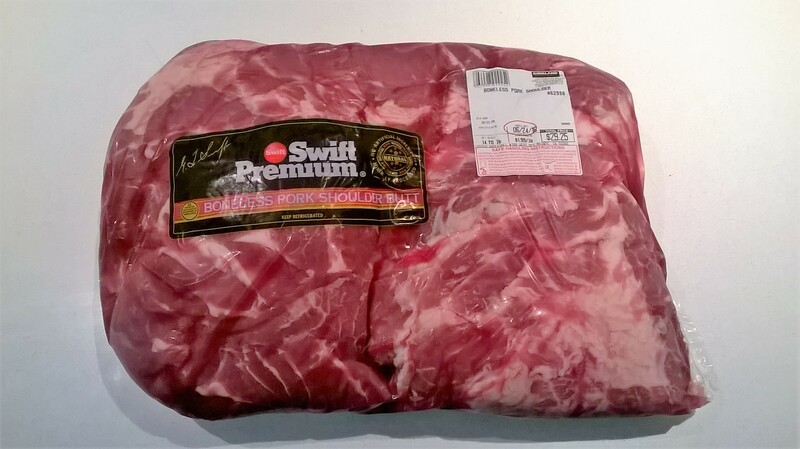 We’re both Midwesterners so no invitation comes without an offer to bring something, and a host never insists guests bring anything — but we both know that bringing something is Official Midwestern Policy. The day before, in our fridge was a Costco container of blueberries. The plan was to make blueberry muffins, experiment with carbonated blueberries (saw this on New Scandinavian Cooking), and eat the rest in yogurt. Paragraphs 1 and 2 were to be separate events. But when I opened the binder of misc. 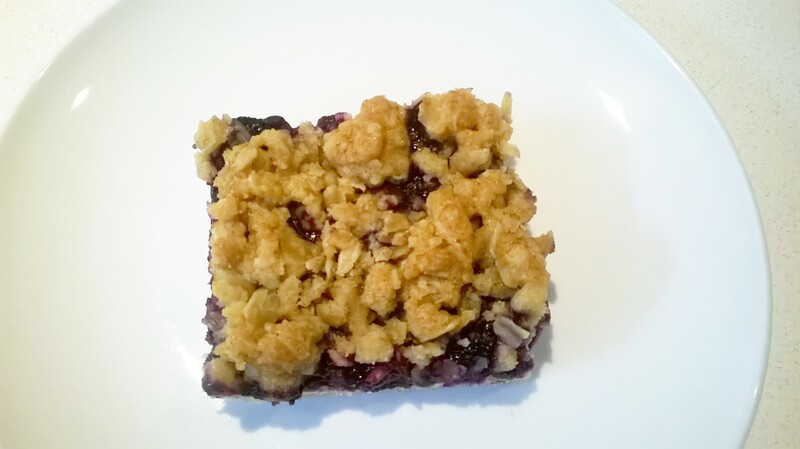 baking recipes, on the flip side of a recipe sleeve was Blueberry Crumble Bars. Hmmmm. 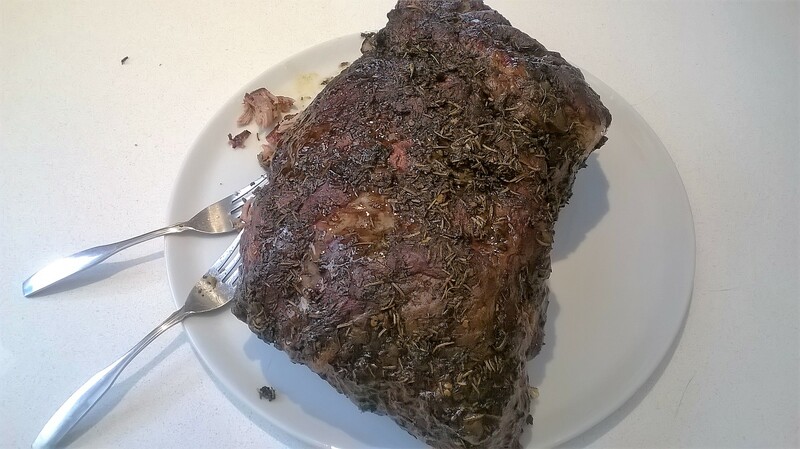 So I broke the first rule of cooking for guests: I used a new recipe. And I upsized it. The recipe called for a jelly roll pan of smaller dimensions than a standard cookie sheet. 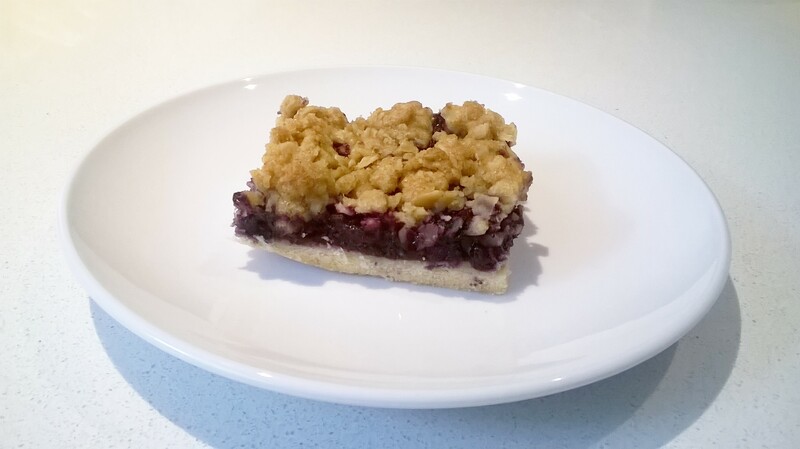 So I just made a generous smidge more of shortbread crust, gooey filling, and strudel topping. Plus, I’d already started eating the blueberries in my yogurt, so I added frozen Maine wild blueberries (in-house stock for blueberry muffins and blueberry buckwheat pancakes) to cover the deficit. The result was pretty terrific, and I don’t have only my opinion to back that up. The hubs, the hosts, and the blueberry-fan guests were also impressed. I may just run with scissors more often. 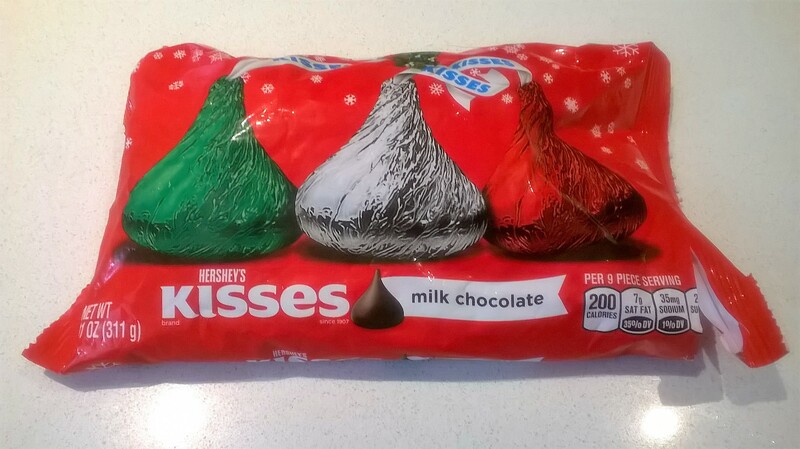 Just opened the last bag of Holiday Kisses. We picked up a handful of these on a luckily timed trip to Target; they had just been marked down about 80 percent. Cheap, cheap, cheap! And using my clever consumption method, I stretch each bag to the max. It’s a diet trick, too. Unwrap two pieces and insert in mouth. Hold to roof of mouth and allow to melt. Nits not ewey nu nalk win nuu nu nis, nut wa noclic laps amut nen nu fiteen mints as nit mets so nuu eet liss. That’s my only strange eating habit. No, wait. 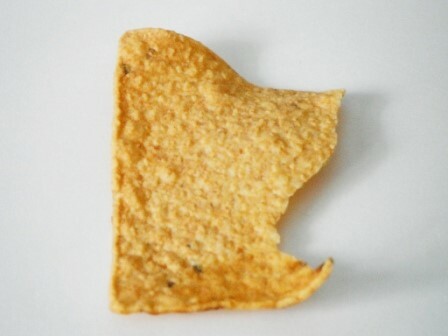 I also like to bite Tostitos tortilla chips into the shape of Minnesota. That’s it. Really. Happy Holidays – winter and summer!